Alfa Investigations Inc. – Providing clients the best possible investigation services in a timely manner at the most competitive prices. If you need fingerprinting for an Immigration Visa or Background Checks, contact Alfa Investigations today. 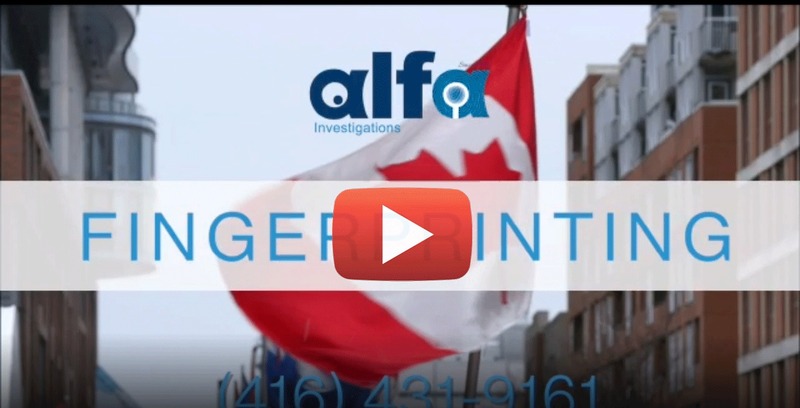 Alfa Investigation is RCMP Certified to perform fingerprint scan you will need for Immigration Visas, Work Permits, Criminal Record Checks or a Pardon. Referrals from Police, Lawyers and Immigration Consultants now welcome. Welcome to Alfa Investigations Inc.
Alfa Investigations Inc. prides itself on high quality investigative services, using the latest technology and a tenacious hard work ethic, ensuring our clients professional and detailed results. We are a multi-faceted team of private investigators, providing a wide range of services to insurance companies, legal firms, municipalities and corporations; acting pro-actively to provide evidence to avoid costly litigation. Feel free to browse through our web site and learn about the services we offer. All instructors are licensed and have a background in the police force or extensive experience in the private investigation field. a licensed private investigation agency providing a wide range of services. Located in Toronto, Ontario, Alfa Investigations Inc. offers its investigative services across Ontario. We provide our clients the best possible investigation services in a timely manner at the most competitive prices. Alfa’s qualified and experienced staff will assist you in resolving your most basic personal needs to investigating the most complex organizational networks. You’ll find what makes us unique is the quality of our supplies, as well as the people who assist you. We carry the best up-to-date equipment in the market to suit your needs.